I had made a tasty but rather homely cherry clafoutis. 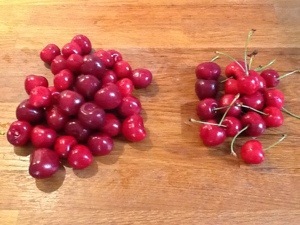 For the detailed recipe, see The Observer, Sunday 26 June 2011: Nigel Slater’s classic cherry clafoutis. I thought the last clafoutis was a little flat, but that might may well been the 00 flour. So I this time I added a bit of baking powder, and a bit less sugar, and it was gorgeous. Preheat the oven to 180C and butter your dish. 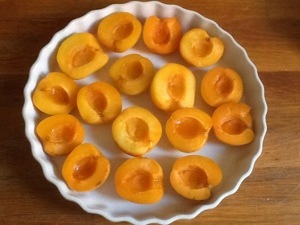 Layer the apricots in with the cut side up, and pour over a splash of Amaretto, if you like that. Just enough for a little on each apricot half. Whisk together all the other ingredients to a smooth batter, and pour it over the apricots. Bake until the clafoutis is golden and puffed up. Sprinkle with icing sugar, and eat warm or cold. 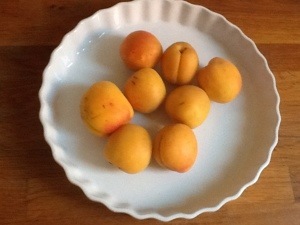 This entry was posted in baking, food, fruit and tagged apricots, clafoutis, dessert, pudding, seasonal on July 24, 2013 by krumkaker. For the detailed recipe, see The Observer, Sunday 26 June 2011: Nigel Slater’s classic cherry clafoutis: 350-400g of stoned cherries. 80g of sugar with 2 beaten eggs, then 90g of flour, 150ml of milk and a drop of vanilla extract. Finally, 30g of melted butter. Bake 35min at 180C. My notes: Wash and dry the cherries, and stone them. It’s a methodical and rather therapeutic process, when it’s just a basket’s worth and there’s a nice evening breeze wafting in cooking smells and you are listening to children playing below before their dinner. Our kitchen overlooks the condominio garden next door, where kids practice bicycling and kick balls which occasionally go over the hedge to our side. Anyway, you might want to wear an apron while stoning cherries or you might get stubborn cherry stains on your clothes, if they are very juicy. (I was making dinner at the same time and forgot…… Worth it though.) Preheat the oven to 180C and butter your dish. Layer the stoned cherries in. Whisk together other ingredients to a smooth batter, and pour it over the cherries. Bake until the clafoutis is golden and puffed up. Sprinkle with icing sugar. Eat clafoutis warm or cold. It was not as pretty as I had hoped, but it was so easy and delicious as was, we thought there was no need for custard. 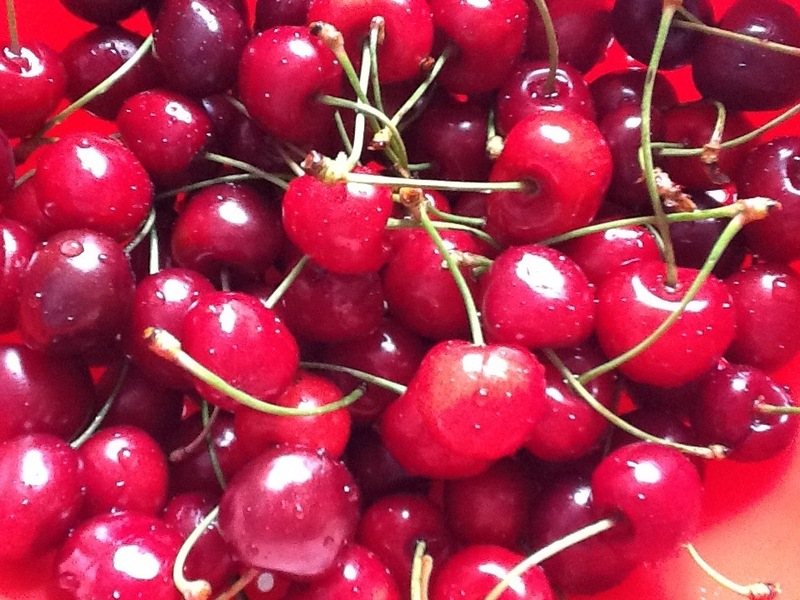 It was light when baked, and the cherries were lovely and juicy. The cherries were so sweet that the icing sugar was not really needed, but I would not quibble with Nigel’s recommendations. Nice cold the next day in my packed lunch as well. I love dessert (who does not? ), though there is often not time for anything fancy, and this one I’ll make again. Next time I might make this with apricots and some flaked almonds, and maybe a splash of Amaretto. The cherry clafoutis recipe also appears in “Tender, Volume II” from Nigel Slater, page 810. 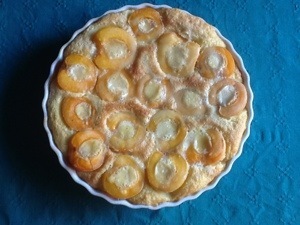 This entry was posted in baking, food, fruit and tagged cherries, clafoutis, dessert, pudding, seasonal on July 7, 2013 by krumkaker. Lovely, are they not? And they smell so good. Maybe a lemon tart will deserve them, something the zest can be used in. 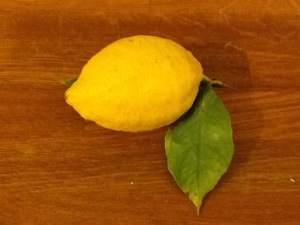 Or a lemon pasta, hmmm……. I will have a ponder. 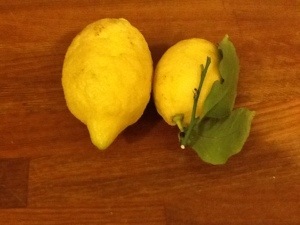 This entry was posted in food, fruit and tagged citrus, lemon, seasonal on June 18, 2013 by krumkaker.